Exide 1450 VA 24V Pure Sinewave Home UPS Inverter - Digital Display@5800 Rs [Mrp:-5800] - Onlinedeals.discount - A leading product discovery and comparison website. Find the true prices of products, read reviews and buy top brand products at reasonable prices. 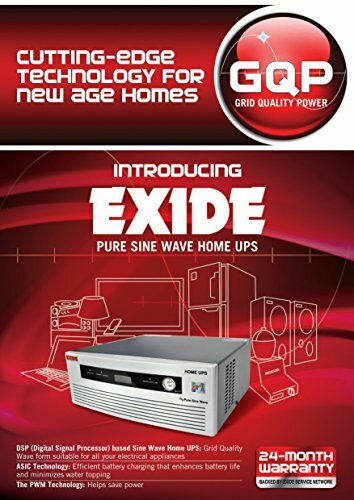 Exide 1450VA Premium Pure Sine Wave UPS Exide Premium Pure Sine Wave UPS System is a high end DSP based Pure SINE WAVE Home UPS with Grid Quality Power Output which guarantees 100% protection and long life of your electrical and electronic appliances. LCD Display : for better user Interface and displaying State of Battery Voltage and Charge , AC mains input voltage , Display Actual load connected in %, Display overload, Short circuit trip , Battery low trip, AC mains Fuse blown, etc. 5. Electrolyte Level Sensor indicator: For indicating Battery water level low. 24V – 2 Nos Batteries required range from 100 to 200 AH. 1. 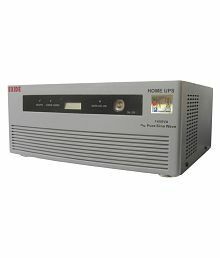 DSP (Digital Signal Processor) based Sine Wave Home UPS – A high speed microprocessor for Grid Quality Power same as Mains. 2. ASIC (Auto Sense Intelligent Control) Technology-Automatically sense the battery condition and adjust the charging current accordingly and thus increases battery life and minimizes water topping. 3. Power factor controlled Battery Charger – reduces electricity consumption. 4. LCD Display : for better user Interface and displaying State of Battery Voltage and Charge , AC mains input voltage , Display Actual load connected in %, Display overload, Short circuit trip , Battery low trip, AC mains Fuse blown, etc. 5. Electrolyte Level Sensor indicator: For indicating Battery water level low. 8. Change over time Mains to UPS and vice versa : < 10 msec (at mains low and High cut) Suitable for PC, LCD, LED TV, FAN, Light, Kitchen Mixer, RO water Purifier,etc. Two years Onsite Manafacturer Warranty. EXIDE HOME UPS ON SITE WARRANTY: 18001035454. Sold by Powerwale. Exide Authorized Dealer for Past 4 Decades and We always bring quality.